1. Sentosa Villas, Seminyak. Set at the bottom of Jalan Petitenget, Seminyak's most happening street, Sentosa's villas are glamorous and luxurious, as guests such as Olympic swimmer and Balinese royal in-law Michael Klim can attest. Costs: From $US420 ($405)/one bedroom, $US550/two bedrooms. 2. The Istana, Uluwatu. The Istana has what money can't buy (permanently) on Bali any more: the most spectacular views over the southern tip of the island at oh-so-romantic Uluwatu. 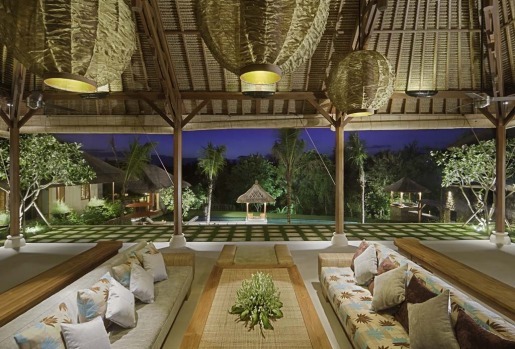 Designed in 2002, the Istana is still the benchmark villa in Bali. The five-suite, two-pool, super-slick cliff-top villa sleeps 10, with additional rooms for kids and domestic staff. Costs: From $2285 a night, minimum five nights. 3. Space Villas, Seminyak. Space has one of the best addresses in town, on Jalan Drupadi (Drupadi Street), between Jalan Dhyana Pura and Jalan Laksmana, yet you'll never hear the roar of traffic or feel the crush of humanity. Set on a long, manicured gang (alleyway), Space's 11 chic villas comprise six two-bed and five new one-bed villas aimed at couples, yet they're still airy and large, with a good-size pool, cabana and open-air bathrooms. Costs From $US385/two bedrooms and $285/one bedroom a night. 4. Puri Bawana, Canggu. Surrounded by rice paddies, luxurious Puri Bawana still has its roots in the Balinese countryside. Set in the upcoming Canggu region, north of Seminyak, it comes with 12 staff including a notable chef and security. The layout is a little bit rock-star, with manicured lawns, romantic day beds, a big media room/kids' den and nannies' rooms. 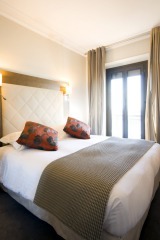 Costs: From $US1095 a night, minimum two nights. 5. Atas Ombak, Oberoi. Atas Ombak is a rare creature: a luxury villa with a 100-metre swathe of beachfront just a heartbeat from bustling Seminyak. There are five bedrooms, each with a divine open-air bathroom, particularly the main suite's garden of lichen-covered statues and outdoor showers. Costs: From $1925, minimum five nights. 6. Kubu Villas, Seminyak. 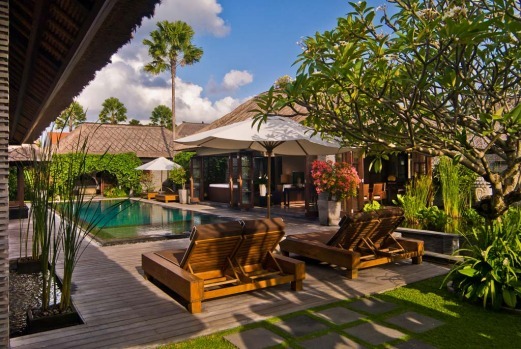 Kubu Villas have been on the scene since 1999, and are well established on prime real estate in the centre of Seminyak. Yet there's not a hint of traffic and, yes, you will hear roosters crowing as you take a morning bath amid the palms and ferns. There are 15 villas in the complex, from one to three bedrooms, serviced by knowledgeable staff and excellent drivers. Costs: From $US245, one bedroom, minimum two nights. 7. Villa Kakatua & Vila Kedidi, Canggu. Two sisters, these are standalone villas in the rural Umalas area, just 15 minutes north of Seminyak. They're a short walk down the street from Echo Beach and have been designed for families - we're talking permanent pool fences and rates easily comparable with booking a swag of hotel rooms. Villa Kakatua has four bedrooms that can sleep up to 10 (one room is a quad), and you can join up with the three-bedroom Kedidi (pictured) for a seven-bedroom extravaganza that sleeps 16. Villa Kedidi costs from $US348, minimum two nights. 7. Villa Kakatua & Vila Kedidi, Canggu. Two sisters, these are standalone villas in the rural Umalas area, just 15 minutes north of Seminyak. They're a short walk down the street from Echo Beach and have been designed for families - we're talking permanent pool fences and rates easily comparable with booking a swag of hotel rooms. Villa Kakatua (pictured) has four bedrooms that can sleep up to 10 (one room is a quad), and you can join up with the three-bedroom Kedidi for a seven-bedroom extravaganza that sleeps 16. Costs Villa Kakatua costs from $US458 a night, minimum two nights. 8. Villa Sungai, Tabanan. Villa Sungai is a single, private villa designed with an eye on the fabulous, from the white-washed teak to Kartell and Philippe Starck statement pieces. Costs. 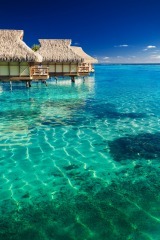 From $1000 a night. 9. The Orchard House, Seminyak. The Orchard family's Bali home for more than a decade, this four-bedroom villa, with another one-bed garden bungalow, is in downtown Seminyak, yet still includes massive lawns and a pool. 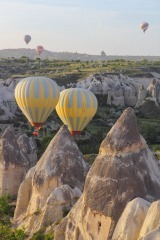 Costs: From $US825 a night, minimum two nights (low-season promotion). 10. Sungai Tinggi, Canggu. 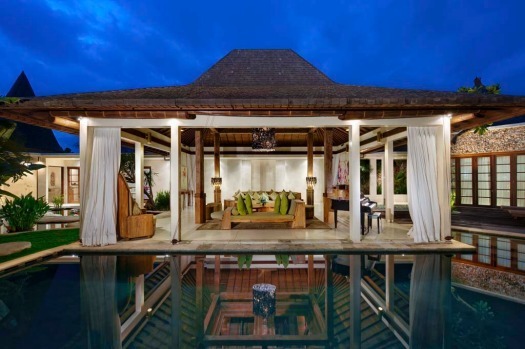 Built for house parties, the living pavilion of this beachfront villa in Canggu is designed as a traditional Balinese wantilan, or meeting hall, overlooking the 18-metre pool and south-western Bali's rugged, black-sand beaches. Costs: Four bedrooms from $US875 a night, two bedrooms $US500. 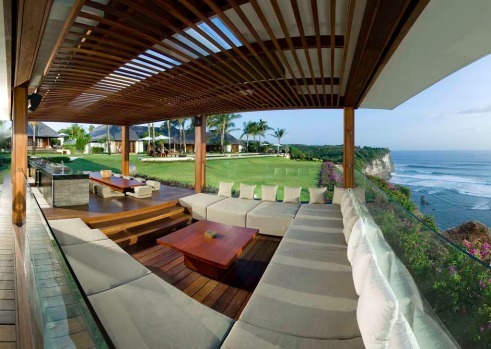 Bali has made a name for itself as a leader in luxury digs. Belinda Jackson reveals 10 of the island's very best. 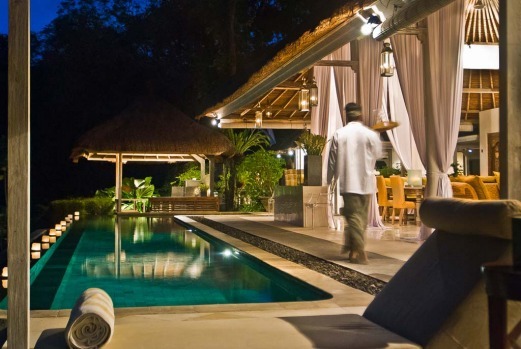 Villas are de rigueur in Bali, with their own pool and daily staff. They range in price anywhere from $100 to $10,000 a night, from simple one-bedroom digs to lavish multi-bure affairs, with butlers, nannies and cliff-top infinity pools. Breakfast is often included in the rate, and you can order all other meals, which the staff shop for daily, so you're paying supermarket prices, not restaurant rates. Kitted out ... Villa Kakatua. There are two schools of design in Balinese villas: the all-white, super-contemporary architecture complete with aircon, beloved by Asian dollars, and the rustic indigenous joglos that have a strong European and Australian following. Bali has plenty of single villas, usually owned by expats who rent them out when they're not using them, but there's also been a steady rise of villa complexes, particularly in the region north of Seminyak. Some are run as hotels, with spas and restaurants, others are more low-key, with a small management team that services the villas each day and helps with basic queries. A word of warning, though: groups with just one child may miss the interaction with other families that hotel pools and kids' clubs can give. Set at the bottom of Jalan Petitenget, Seminyak's most happening street, Sentosa's villas are glamorous and luxurious, as guests such as Olympic swimmer and Balinese royal in-law Michael Klim can attest. 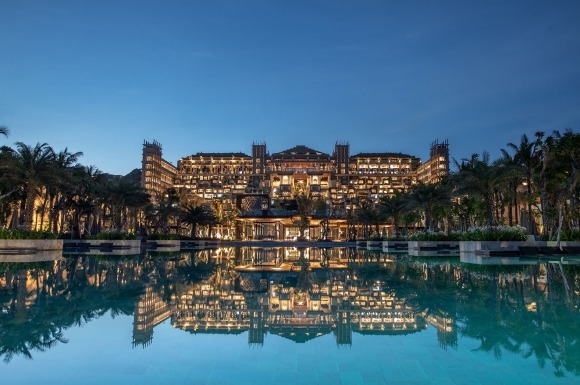 The complex has more of a hotel vibe - think breakfast being served beside the main pool - and staff will whisk you around in electric golf buggies. The 45 villas range from one-bedroom to the five-bedroom presidential pool villa. With a contemporary design, the bedrooms, kitchen and living room pavilions encircle the pool, and all can be closed up to get the aircon blasting. In the neighbourhood Potato Head Beach Club and W hotel, just across the road, for sundowners. Who's staying? Celebrities and hipsters who need to be within five minutes of Bali's top restaurants. Costs From $US420 ($405)/one bedroom, $US550/two bedrooms. +62 361 737 676, balisentosa.com. The Istana has what money can't buy (permanently) on Bali any more: the most spectacular views over the southern tip of the island at oh-so-romantic Uluwatu. 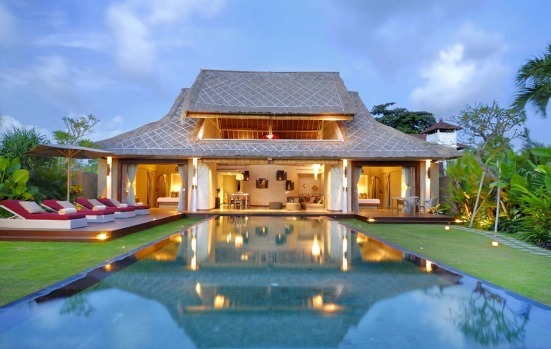 Designed in 2002, the Istana is still the benchmark villa in Bali. The five-suite, two-pool, super-slick cliff-top villa sleeps 10, with additional rooms for kids and domestic staff. Designed by the go-to man in the tropics, French architect Fredo Taffin, it's very, very private, luring celebs and exclusive weddings. Forget queuing at busy beach bars for sunset views, the villa's 26 staff are at hand to help you enjoy your own bar. It's five minutes' walk to the beach and five minutes' drive to the famed Uluwatu Temple. In the neighbourhood Pura Luhur Uluwatu (temple) for the monkeys, Bulgari hotel and Alila Villas Uluwatu for cocktails and lunch. Who's staying? A-list wedding parties, Jakarta millionaires and serenity-seeking statement makers who've done Seminyak strip. Costs From $2285 a night, minimum five nights. +62 361 737 498, theistana.com. Space has one of the best addresses in town, on Jalan Drupadi (Drupadi Street), between Jalan Dhyana Pura and Jalan Laksmana, yet you'll never hear the roar of traffic or feel the crush of humanity. Set on a long, manicured gang (alleyway), Space's 11 chic villas comprise six two-bed and five new one-bed villas aimed at couples, yet they're still airy and large, with a good-size pool, cabana and open-air bathrooms. Villas can be interconnected, ideal for extended families. They are five minutes' walk from some of the island's best shopping and restaurants, and come with a dedicated butler to cook your breakfast in-villa each morning, and a driver. Totally geared up for foreigners and kids, expect pool gates, great concierge services and impeccable staff. In the neighbourhood Hot restaurants including Mamasan on nearby Jalan Raya Kerobokan, and a Jalan Oberoi's sensational, credit card-loving boutiques. Who's staying? Repeat visitors and couples with young babies who are snapping up the one-bed villas. Costs From $US385/two bedrooms and $285/one bedroom a night. +62 361 731 100, spaceatbali.com. Surrounded by rice paddies, luxurious Puri Bawana still has its roots in the Balinese countryside. Set in the upcoming Canggu region, north of Seminyak, it comes with 12 staff including a notable chef and security. The layout is a little bit rock-star, with manicured lawns, romantic day beds, a big media room/kids' den and nannies' rooms. Rates include entry to Bali's most exclusive private club, the nearby Canggu Club, for a spot of sport or to eat in one of its restaurants. Up-and-coming Echo Beach and the laid-back Hotel Tugu are at the end of the road and Canggu is about 20 minutes from Seminyak, best described as "the Bali vibe without the clutter". In the neighbourhood Hotel Tugu on the beachfront for dinner, drinks, yoga and cooking classes. Who's staying? Need-it-all-now groups who require space to accommodate their big entourages. Costs From $US1095 a night, minimum two nights. +62 361 737 498, puribawana.com. Atas Ombak is a rare creature: a luxury villa with a 100-metre swathe of beachfront just a heartbeat from bustling Seminyak. There are five bedrooms, each with a divine open-air bathroom, particularly the main suite's garden of lichen-covered statues and outdoor showers. The property is dominated by an enormous bale with an army of soft sofas that look on to the pool and out to sea, where the local fishermen pull up their longboats during the spectacular sunsets. Set on 6000 square metres, the villa is in its own little world, with 25 staff on hand to ensure you won't go without. In the neighbourhood Naughty Nuri's Warung for Anthony Bourdain-rated martinis and Mozaic Beach Club for a dip and dinner, on Jalan Batu Belig. Who's staying? Lavish, big-scale entertainers and chic wedding parties looking for the perfect beach backdrop. Costs From $1925, minimum five nights. +62 361 737 498, atasombak.com. 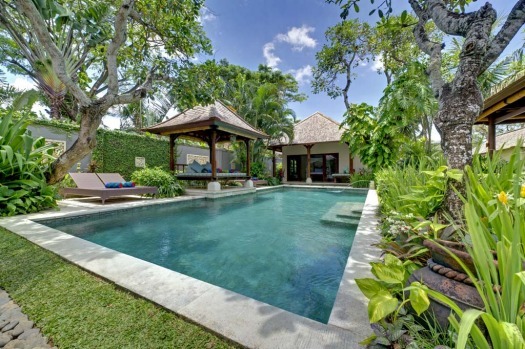 Kubu Villas have been on the scene since 1999, and are well established on prime real estate in the centre of Seminyak. Yet there's not a hint of traffic and, yes, you will hear roosters crowing as you take a morning bath amid the palms and ferns. 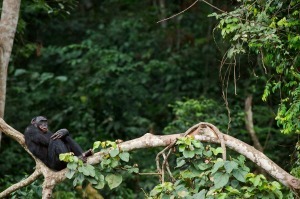 There are 15 villas in the complex, from one to three bedrooms, serviced by knowledgeable staff and excellent drivers. Designed by the Australian owner, every villa is different, but all include a swimming pool, tropical gardens, open-air joglos as the living space and thatch-roof bales. 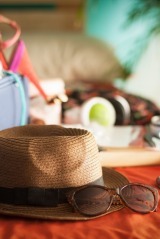 The rate includes airport transfers, daily breakfast, wi-fi and shuttles to Seminyak. In the neighbourhood Upcoming boutique strip Jalan Kunti, home to Word of Mouth for fashion and fashionable lunch. Who's staying? Families and older couples who like Kubu's sense of security and convenience. Costs From $US245, one bedroom, minimum two nights. Ask about the stay-four/pay-three deals until March 15. +62 361 738 905, villakubu.com. Two sisters, these are standalone villas in the rural Umalas area, just 15 minutes north of Seminyak. They're a short walk down the street from Echo Beach and have been designed for families - we're talking permanent pool fences and rates easily comparable with booking a swag of hotel rooms. Villa Kakatua has four bedrooms that can sleep up to 10 (one room is a quad), and you can join up with the three-bedroom Kedidi for a seven-bedroom extravaganza that sleeps 16. Both have open living and dining pavilions and bales by the pool, and are kitted out with cots and high-chairs, with car seats available for hire. 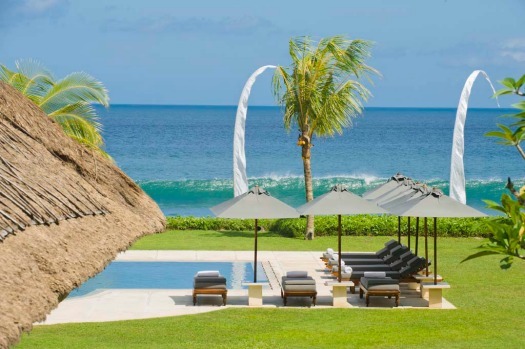 The staff are shared between the two villas, including a villa manager as your go-to person, three cooks, three housekeepers and 24-hour security, with babysitters and masseurs lurking to lend a hand. In the neighbourhood Jalan Pantai Berawa for affordable neighbourhood restaurants, from Japanese to Italian, patronised by expats. Who's staying? Groups of two families with school-aged kids who still want to shut the doors on each other at the end of the night. Costs Villa Kakatua costs from $US458 a night, minimum two nights. +62 361 737 498, villakakatua.com. Villa Kedidi costs from $US348, minimum two nights. +62 361 737 498, villakedidi.com. Leave the mania of the Kuta bottleneck behind for Cepaka, a small village in the Tabanan district. Villa Sungai is a single, private villa designed with an eye on the fabulous, from the white-washed teak to Kartell and Philippe Starck statement pieces. Surrounded by village temples, Cepaka is still only a quick sprint from Seminyak. Sleeping up to six adults in three bedrooms, the life of this sophisticated villa is the living pavilion, which faces the 18-metre infinity pool overlooking the Agung River. Next door, Sungai Gold is the newer couples' residence, with two identical master suites, so nobody draws the short straw. Price includes airport transfers, evening canapes, 24-hour butler services, and a car and driver. In the neighbourhood Tanah Lot to the south and Bali's beautiful rice terraces to the north. Who's staying? 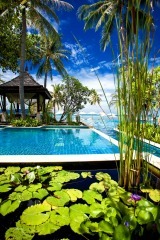 Lovers of haute design and Balinese culture, big media names. Costs From $1000 a night. +61 (0) 410 324 535, bali-villasungai.com. The Orchard family's Bali home for more than a decade, this four-bedroom villa, with another one-bed garden bungalow, is in downtown Seminyak, yet still includes massive lawns and a pool. 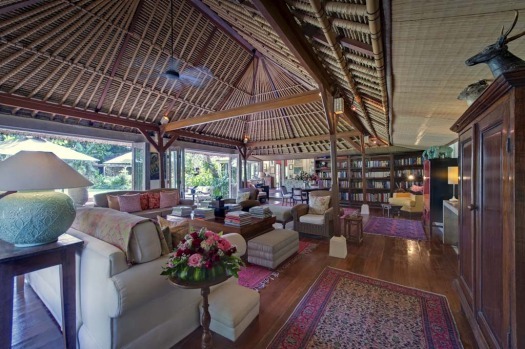 You won't find another villa like it in Bali - the artwork, books, antique rugs and furniture were carefully chosen by Charles Orchard, a renowned furniture and interior designer, yet it's still very kid-friendly, with chic bunk beds and toys, from karaoke to dress-ups. A little gang connects you to the Orchards' inspiring interiors shop. In the neighbourhood Jalan Raya Seminyak for homewares and fashion, Seminyak beach and SOS Supper Club. Who's staying? Design-savvy multi-generational families who each like their privacy. 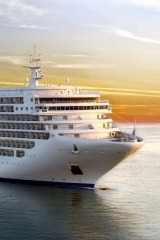 Costs From $US825 a night, minimum two nights (low-season promotion). +62 361 737 498, theorchardhousebali.com. Built for house parties, the living pavilion of this beachfront villa in Canggu is designed as a traditional Balinese wantilan, or meeting hall, overlooking the 18-metre pool and south-western Bali's rugged, black-sand beaches. The villa displays beautiful fabrics and artworks collected by its Australian owners. There are four bedrooms plus two studies that can accommodate 10 at a pinch, though it can be booked as a four-, three- or two-bedroom villa, all with exclusive use. 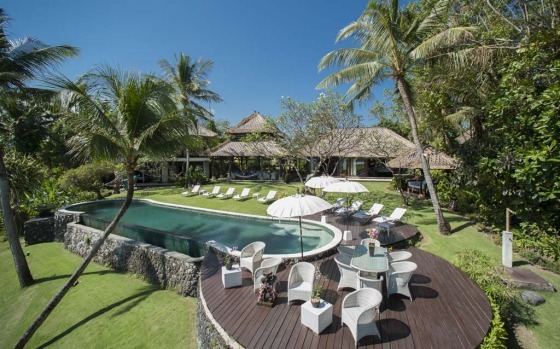 The trick to staying in Canggu is to plan your days to either be in town lunching and shopping, or staying around the villa, lolling by the pool or catching a few waves. Along with the 15 intuitive staff, who have been looking after the family for years, the tariff includes a car for eight hours a day, mountain bikes and a tennis court. In the neighbourhood Pererenan, Seseh and Echo beaches, home of some of the best surfing on the island. Who's staying? Discerning groups of surfer friends who don't want to keep it down for the neighbours. Costs Four bedrooms from $US875 a night, two bedrooms $US500. +62 361 737 498, sungaitinggivilla.com. - Ask about last-minute discounts for booking just 10 to 14 days before arrival. - Have you got the full price? Rates quoted usually don't include government tax (10 per cent) and services charges (from 5 per cent). - Check if the rate includes daily breakfast, airport transfers and drivers, or if these cost extra. - Consider a delicious VIP meet-and-greet service, which whisks you past customs in minutes. All villas can organise this in advance. - Check the floor plans before you book — quick-buck developers have ensured the rise of townhouse complexes with high walls and handkerchief pools.